Great produce is key. 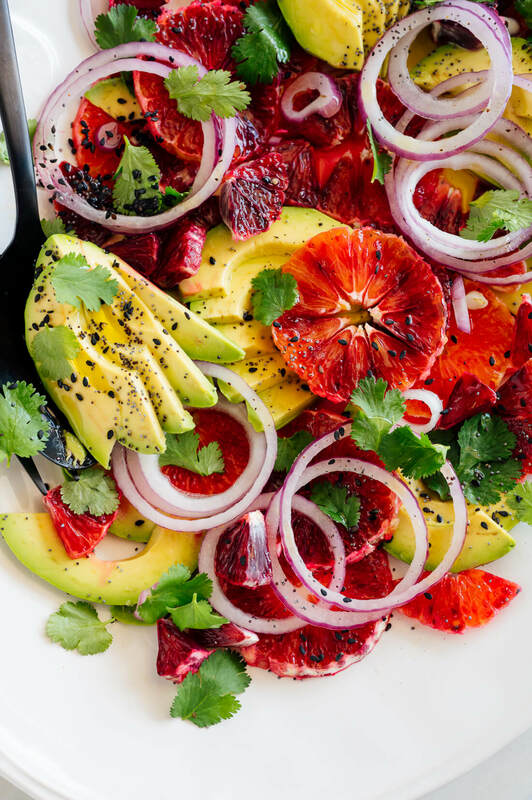 You can’t make a great blood orange and avocado salad without great citrus and perfectly ripe avocado! Use your best judgment. 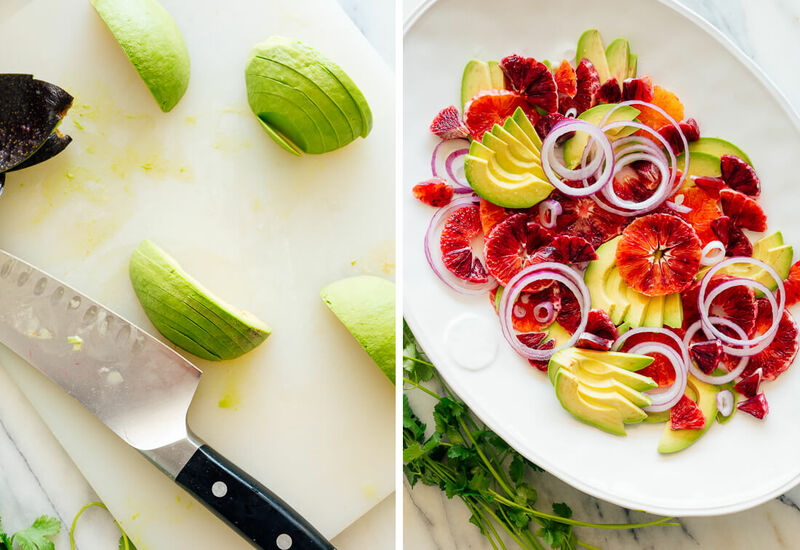 Produce size varies quite a bit, so you might want to use two small avocados if you can’t find one large, or throw in an extra orange if your oranges are small. Add as much onion as seems right, but don’t overdo it. Choose your seeds. Alison’s first suggestion is nigella seeds, which I don’t keep on hand. Maybe I should. Black sesame seeds are great, too, if you can find them (they are more intensely flavored than regular white). She also offers poppy seeds as a suggestion, so I tried them when I made this salad, but I didn’t like those as much. Pepitas are also good! To slice your onion: You’ll want to do this first so the onion can soak in ice-cold water while your work on the rest (this mellows the onion flavor and makes the slices nice and crisp). Cut off the paper end of the onion and peel off the papery skin. Firmly hold the onion against the cutting board so the center runs parallel to the cutting board, and use a sharp knife to slice straight down. You’ll want your onion rounds to be as thin as possible. To slice your oranges: First, peel off the skin and pull off any big clumps of pith. Carefully hold the orange on its side, with the center running parallel to the cutting board, and use a sharp knife to cut the orange into 1/4-inch thick rounds. If your citrus is very ripe, the rounds may fall apart, but that’s ok! To slice your avocados: Cut the avocados in half from stem end to base, and carefully remove the pits. Then cut the halves in half again to make long quarters. Peel the avocado skin off of each quarter and carefully slice it into long, 1/4-inch thick strips. Choose another type of citrus. Any orange will work. Cara caras are particularly good. Ruby red grapefruit might even be nice. Add sumac and/or Aleppo pepper flakes. Sumac is a Middle Eastern spice that is sour and citrusy, so it emphasizes the citrus flavor. (Maybe you have had it on hummus before.) Aleppo pepper flakes are more mild red pepper flakes that offer some nice flavor as well as heat. 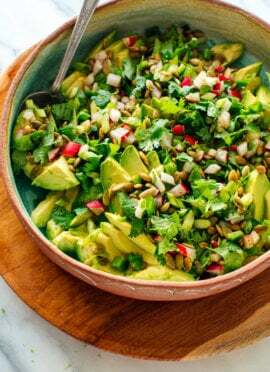 For a Mexican variation, substitute toasted pepitas for the sesame seeds, and add a small jalapeño. Slice your jalapeño very thin, and shake out the seeds (they’re the hottest part). Please let me know how this recipe turns out for you in the comments! I hope you enjoy it as much as I do. 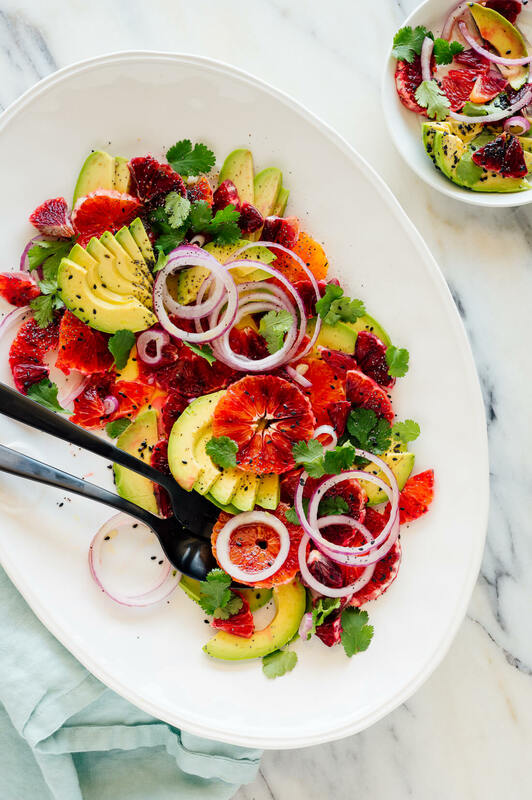 I love the citrus-avocado combination and make a similar salad, tossing in a handful of pecans and some crumbled blue cheese. Totally addictive. I have company coming next week, and I’ll try your version–it’s gorgeous! Oh that sounds nice too, Kathryn! Let me know what you think. Wow! What a beautiful salad! 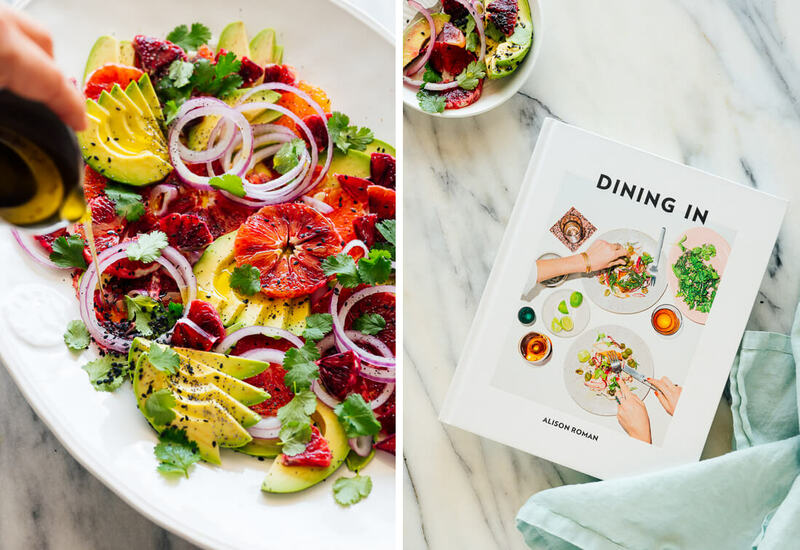 I just received some blood oranges and avocados in my Imperfect Produce box and was wondering what to make. Thanks for sharing! As denoted, the recipe is wonderful. We just got the last of the blood oranges per the season and they used for tonights meal. As per your other recipes, you have wonderful talent and taste. All the best in your endeavours. This salad looks amazing! I’ll definitely have to give it a try! Let me know what you think, Heather! Made this salad this evening, and it was fantastic! Blood oranges are going strong here still in California though I don’t buy them often, usually preferring mandarins. 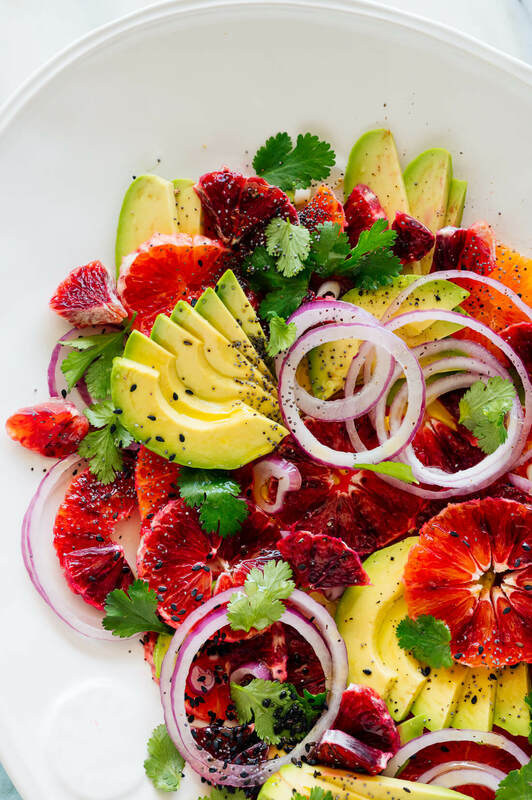 But I thoroughly enjoyed this blood orange salad, and the lime really brought out all the flavors. Thank you for your wonderful, creative recipes! Five stars? When I can’t even EAT the darn thing. Well, yes. First of all, those pictures! 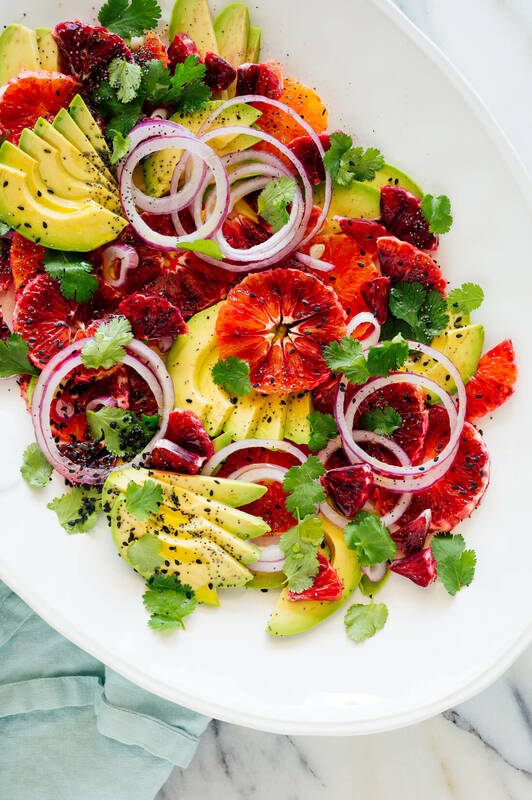 Do blood oranges have to be so delicious and beautiful? But it was the note, warning about the blood orange/grapefruit link that got me, and partly explains why your blog is so phenomenal. I didn’t know and my husband takes blood pressure medicine and I have cancer! So I think I may skip this beautiful one and make another. Instead, like Janet, my letter is more fan mail than review, but I have Never had one of your recipes be anything but great and I love the way you give us the freedom to make them our own by your suggestions and ‘change it up’ ideas. Bought the cookbook yesterday and am equally inspired by it. Cherry Crumble tonight, with my other eye on those wraps. Keep up the good work. I made this salad last night and my husband couldn’t get enough! We both loved it. Thank you! When a recipe is so gorgeous is stops you dead in your scrolling tracks! Can’t wait to try. Thanks, Gaby! I of course couldn’t resist! Everything you post is always inspiring and delicious!! I look forward to the email and often share. We made the chick pea noodle soup last week and loved it. I made this and wow! Such flavor and color! Thank you for trying it, Sue! Fantastic flavours, even using regular oranges! Thank you for trying it, Diane! 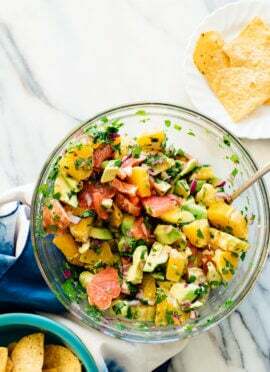 It’s so lite salad item, and i never try orange avocado combination in salad but i think we can add cucumber and carrot in this salad item which can make this more lite and change some taste of salad because avocado and orange is nice combination. Winner! Made this for the first time for guests, which is a compliment to you because I knew it would be good without having to do my own test run! Thanks for the faith, Lora! I appreciate you taking the time to comment. Wow so lite salad. I never heard about orange avocado combination in salad items.. i want to try this brand new salad items… but what can i use instead of virgin olive oil… ? You could leave it out and use a little more lime juice. Let me know what you think! Made it as the recipe indicated but used regular oranges. Couldn’t come up with blood oranges. Excellent and very appealing. Easy to put together and it looks great. I haev my own blog and love your style! What recipe plug in do you use to get your recipes looking so good!? This was the best winter salad with a Mexican chili/stew. 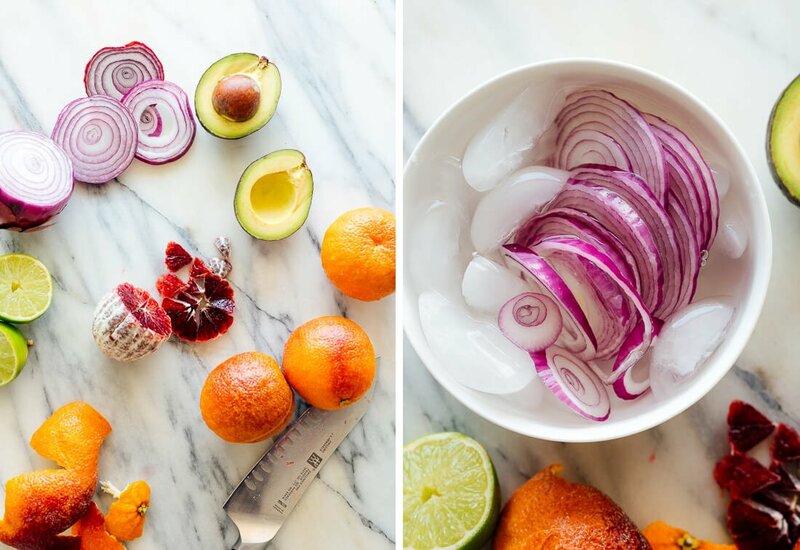 I loved the tip on chilling the red onion in ice water before serving – will do that for most salads when red onion is an ingredient as it made a delightful difference. And I used green pumpkin seeds from the bulk foods, and added a mix of blood oranges and regular oranges since I had them on hand. Colorful, and delicious. Thanks for sharing this! Thank you for sharing, Jo! I appreciate the feedback and your approach. 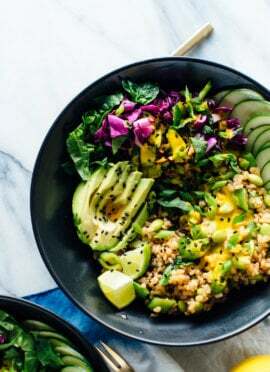 This salad looks absolutely gorgeous and is delicious! I love that you plan to cook from this book – I have a copy but have not used it much. Would love to hear about any other recipes you enjoy in a future post – I always LOVE every Cookie+Kate recipe I make, you are one of my go-to/never-fail sites. PS Pick up the nigella seeds if you get a chance. They have a nice smoky onion/herby taste – I love them sprinkled on eggs or soups. I might just need to get them, Terri! Thank you for your review. Look delicious! Thanks for sharing such a delicious recipe. Have just begun a Whole 30 cycle and saw this salad … perfect for my dinner this evening with a simply roasted pork tenderloin. Thank you !